Frankly, I'm miffed. Sexobon hasn't insulted me yet (that I'm aware of). What's up with that? I did not take that miss. I never told anybody to lie, not a single time; never. tw should challenge sexobon to a duel with the weapon of choice being the RPK-16. Fun is greater with an AR-16. Using MS-16 a judges. 16 was also a good year. I still had enough fingers and toes to count the years. 16 was also a good year. Of course, '16 is the year Trump was elected President. And as a result, '16 is the year I joined the Resistance. I can't wait until the democrats start the Civil War, but first we must finish winning the Battle of Bowling Green. And as a result, '16 is the year I joined the Resistance. Well 2000 years later, the world went to hell. 16 was a good year. ...but first we must finish winning the Battle of Bowling Green. 94 participants ran Australia’s Ellery Brookman Goldfields Pipeline Half Marathon earlier in July. The typical finisher had approximately 2.02 legs. The average was thrown off by a local stray dog named Stormy, who met the runners before the race and then, citing a light schedule of licking himself and sleeping for 18 yards that day, decided to join them. Stormy ran the course diligently, hitting every checkpoint and finishing with an estimated time of 2:30 — good enough for a top 70 finish. 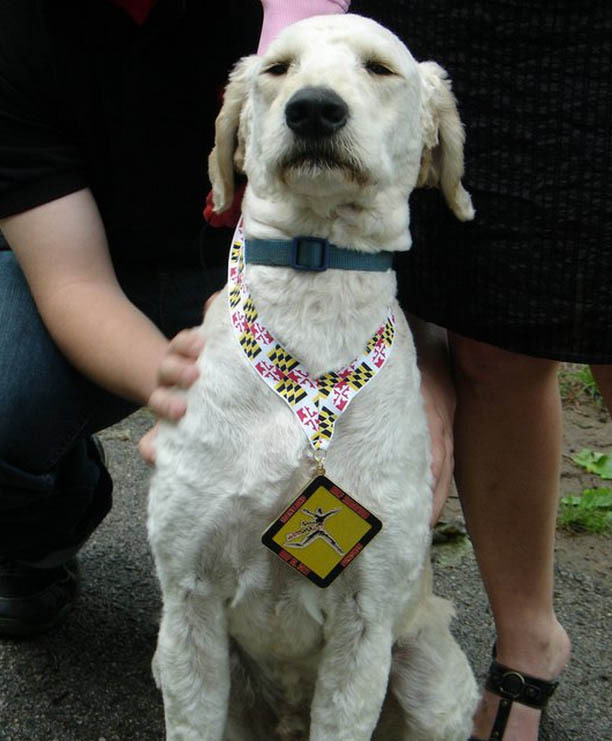 Despite not wearing a bib, the very good dog was recognized for his efforts, earning a medal for running 13.1 miles despite stumpy legs. At the race stations he was having a little runaround and saying hello to the volunteers and participants, and then he would team up with another runner and keep on following the crowd. He was just out there having a trot through the bush and enjoying people’s company. Stormy didn’t get much time to revel in his accomplishment, however. Rangers took the canine from the finish line, which is a pet-free zone, to the pound after no one claimed him at the end of the race. He’ll spend up to seven days in dog jail waiting for his owner to pick him up. Organizers were told the good boy is a year-old resident of a local Aboriginal community who doesn’t have a single owner, but knows everyone in town. We thought he deserved a medal since he had done the whole thing. So Allison and I went down to the rangers, gave him a medal and gave him more exposure so hopefully the owner might see. If no one claims the rugged half-marathoner pup by the end of the week, he’ll be put up for adoption. Anyone in western Australia looking for a running mate will be able to apply to give him his forever home for a cost of about $300, plus expenses. So, if you’re feeling unmotivated today for any cause, just remember; if this stumpy little Australian dog can do it, so can you. I had a feeling that I'd seen a similar report a couple of years ago. The marathon entrant finished in seventh place, but she made several stops along the way. Ludivine, a two-year-old bloodhound in Alabama, won a medal for her seventh-place finish in the Trackless Train Trek Half-Marathon. She raced with other, two-legged runners, crossing the finish line of the 13.1-mile course with a time of 1:32:56. All of this came as quite a surprise to Ludivine's owner who had let the dog out to do her business and thought she was just out running in the woods. What IS it about the half marathon that dogs love it so much!! It's the only race they ever run!! Why: because they can't do a full marathon, and any shorter race is not newsworthy. Therefore the half marathon is the only race we will read about good dogs entering. Let's see if this hypothesis proves out. Sometimes they even train dogs to do it for blind marathon runners. (Mute your speakers, a video on the page autoplays.) But they freely admit that of the 165 they've been training for marathons with the blind, only 12 are "race-ready."